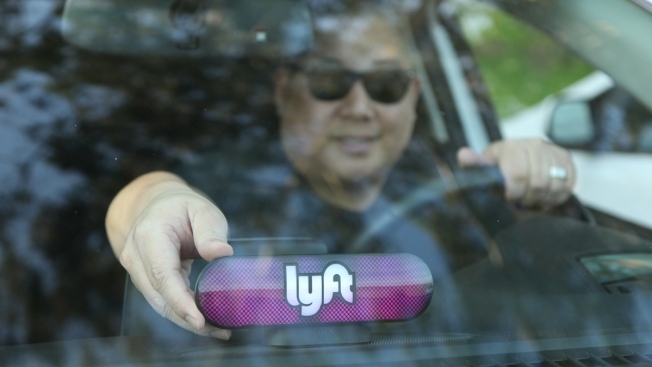 In this Jan. 31, 2017, file photo, a Lyft driver places a company device on his dashboard in San Francisco. Lyft released its long-awaited IPO prospectus Friday, revealing company financials for the first time. The ride-hailing company has been racing competitor Uber to the public markets. It's likely to be among the first of a hefty class of 2019 public offerings. It is seeking to go public on the Nasdaq under the ticker symbol "LYFT." Uber, Lyft drivers to get stock in IPOs from CNBC. Lyft didn't specify an amount it hopes to raise in the public offering, instead opting for a placeholder amount of $100 million. Reuters reported earlier that Lyft expects to be valued between $20 billion and $25 billion in its IPO. Uber, which has been releasing unaudited financials for several quarters, was said to seek valuation as high as $120 billion for its upcoming IPO, according to The Wall Street Journal. Japanese ad-tech company Rakuten stands to see that largest windfall from a successful debut. The company owns 13 percent of Lyft, followed by General Motors' 7.8 percent stake and Fidelity's 7.7 percent stake. Alphabet owns 5.3 percent.